Last week, a male lion from the Kruger National Park was baited and trophy hunted in Umbabat Private Nature Reserve, which forms part of the Associated Private Nature Reserves (APNR) and forms part of the Greater Kruger National Park. Regrettably, this high-handed ecologically irresponsible attitude to trophy hunting for commercial purposes goes back decades in the APNR – the only region on earth where the rare White Lion has occurred naturally. In May 2006, one of 2 resident pride males was commercially trophy hunted in the very same area of Umbabat (Cadman, M. Sunday Independent 28 May 2006). The hunted male was the father of White Lion cubs born shortly after he was brutally shot as a trophy. The hunting of pride male lions goes against responsible ecological principles and the hunting protocol of the APNR, causes the killing of cubs by rival male lions (infanticide), and disruption of pride social structure. Like the notorious case of Cecil the Lion, this brother suffered from the bullet wound injuries over many hours before he was finally tracked down and his suffering ended by a conservation official. His White Lion cubs, spotted shortly after, were the first born in nearly two decades in a region where commercial trophy hunting of lions is legalized. Needless to say, the cubs didn’t survive the pride take-over that followed. As the Global White Lion Protection Trust, we commend the incoming wardens and land owners who are objecting to the hunting quota in this highly sensitized biodiversity hotspot. The wildlife of this UNESCO-declared Kruger to Canyons Biosphere is a national and global heritage that deserves to be treated ethically, with our love, as well as our respect. We welcome the support in our decades-long mission to proclaim the importance of protecting these genetic rarities in their endemic habitat for future generations. The question we have been asking of our government over the decades is: with borders open to the Kruger National Park, why is commercial trophy hunting still allowed in buffer reserves neighbouring our national parks? The commercial argument for trophy hunting at the expense of ethics and conservation principles is unacceptable. The conservation success of Africa Parks is well known, and their model does not include hunting. The Global White Lion Protection Trust was interviewed by Mike Cadman for the below newspaper article, published on 28 May 2006 in the Sunday Independent, covering the story of more than one botched hunt in the same area. Two extremely rare white lions have been born in the Umbabat Private Nature Reserve (UPNR) bordering the Kruger National Park and their birth, along with two recent unsavoury hunting incidents, has prompted a moratorium on the shooting of the big cats in the area. White lions have been extinct in the wild since 1997 and the last wild cub was believed to have been born about 12 years ago. The cubs were first seen by property owners and rangers from the Ingwelala Shareblock in the UPNR on Tuesday this week. 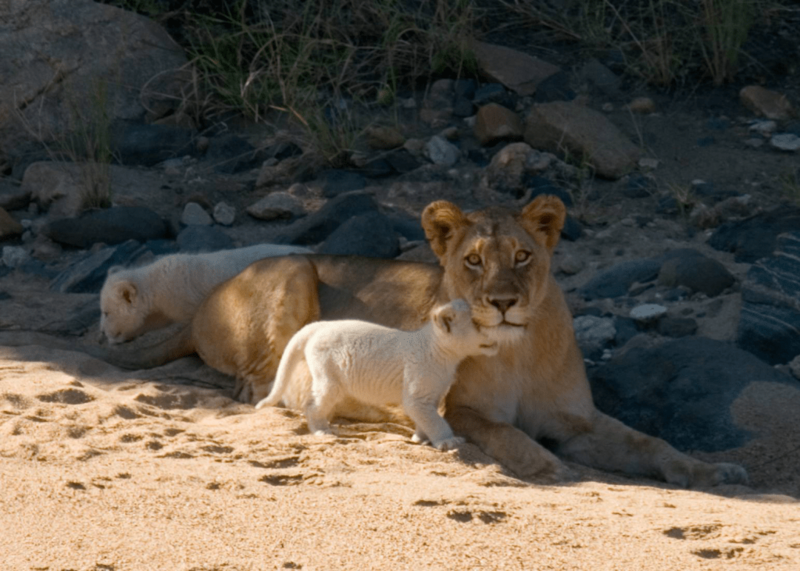 “The birth of the cubs justifies the argument that the white lion gene is present in this area amongst wild populations,” Paul De Luca, a spokesperson for the UPNR, said. De Luca said protocols were being drawn up to ensure that the white lions were not unduly harassed by game-viewing vehicles. “We know that these are very unusual animals and that they will understandably attract considerable interest but we want to ensure that they live normal lives,” he said. White lions are only known to occur in the wild in the Timbavati area, which borders the Umbabat. These two reserves, alongside the Klaserie and Balule nature reserves, form the Associated Private Nature Reserves (APNR). There are no fences between the APNR and the Kruger National Park. The white lions of Timbavati received widespread publicity in the 1970s after a researcher, Chris McBride, identified their presence in several prides. Although some were moved to zoos in an effort to ensure their safety, the wild populations died out. Linda Tucker, the founder of the Global White Lion Protection Trust, said that the birth of the cubs was of considerable importance in the fight to protect white lions. “White lions are more than a national treasure, they are a global treasure,” she said. Tucker and Jason Turner, a lion ecologist, are reintroducing four captive white lions into the wild on a property near Timbavati. White lions are born to tawny lions carrying a recessive gene. The birth of the white cubs follows widespread criticism of two botched lion hunts in the UPNR and Timbavati. In one incident, a well-known male lion, one of two dominant males known as the Sohebele brothers, was shot and wounded by a hunter within earshot of tourists boarding game-drive vehicles. The hunter later repeatedly drove a tractor at the lions in attempt to separate the injured lion from its brother, but when this failed he called in conservation staff to help destroy the lion the next morning. In the other incident, a selected trophy lion was tracked for several days in Timbavati, but it took cover with other lions in thick bush and in the ensuing confusion the hunter shot the “wrong” animal. De Luca said that both incidents had been investigated and that “the outcome of the investigation into the lion hunt in the Umbabat was one of management failure. We failed to attach the hunting protocol to the hunting permit and the hunter said he was unaware of the contents of the protocol”. No further action was taken in the UPNR case but disciplinary action was taken against a staff member at Timbavati. De Luca said these incidents and the birth of the white lions had resulted in a rethink on lion hunting. “The UPNR will impose an immediate moratorium on lion hunting,” he said. Elephant, lion and buffalo trophy hunts have been permitted in the APNR as a means of raising revenue. But De Luca said that trophy hunting was under scrutiny and that “all the reserves in the APNR are looking to find alternative sources of revenue other than professional hunting”. Earlier this month Marthinus van Schalkwyk , the minister of environmental affairs and tourism, published a draft set of norms and standards recommending that the minister himself must approve all hunting that takes place in areas adjoining national parks where fences have been removed. It is also proposed that the captive breeding of predators for “canned hunting” should be outlawed. White lions have been widely bredby operators catering for the lucrative “canned hunting” industry, with about R1 million being paid by a hunter for a large white male in 2001. Canned hunting entails the shooting of a hand-raised animal that has almost no chance of escaping from a small fenced area.